We wouldn't be surprised if Bridge Road founder Ben Kraus surveys the contemporary beer world and allows himself a wee chuckle now and then. For years, his was pretty much the only saison available (there had been Matilda Bay's Barking Duck; Temple brewed one for a while) and now they're all at it. We're not complaining as Crafty has been an advocate for the style for years too; not only does a good one have, as Ben insists, appeal for newcomers to craft beer as well as enough interest for aficionados, but it is a style perfect for the Aussie climate. 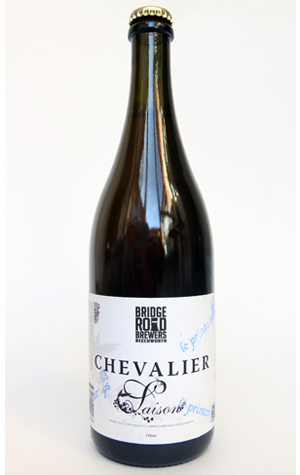 A few years ago, he released a couple of limited run takes on his Chevalier Saison, one brewed with stolen (or borrowed) quince, another featuring elderflower plucked from the rear of the brewery. The latter – Saison le Printemps (of spring) – returns for, um, summer in the familiar Chevalier wine bottles. The floral addition gives the beer, surprise, surprise, a floral twist to the aroma but more pointedly adds a musty, dank, almost hay like character to it as well, making the beer more farmhouse than the original. The effect is also to soften the spiciness on the palate of this cloudy pale yellow drop, making for an intriguing twist on the original.